Empty store fronts are not new to urban areas across the nation. While everyone is chatting about how to utilize the empty space left in the suburbs by bankrupted retailers like Toys R Us, Main Street America has been fighting the good fight for quite a while. 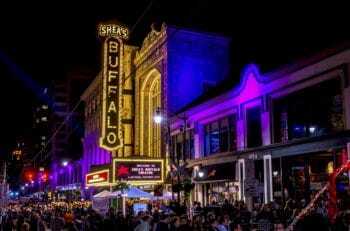 Cities like Buffalo, NY belong to a long list needing help revitalizing their downtown. Right now, there are more than ten prime storefronts sitting empty just on Main Street, including the recently closed CVS that spent 41 years near City Hall. See leasable space available in Buffalo. You probably got some small, fun stores, but not a lot. And you’re going to be hard-pressed to find traditional, Main Street retailers. But, what about the commuters who are in the city during the week? Companies encourage employees to stay in the office at lunch by opening cafés and providing gyms. So, while there are more than 50,000 commuters who are in the city during the work week, they are not exploring at lunch or staying around after work. As most chose to shop near their homes in the suburbs. Businesses do exist in downtown today, but only in certain parts of the city. The Theatre District is home to the Shops at Market Arcade, Shea’s Performing Arts Center, and other very niche stores which sell gourmet dog treats, letterpress cards and funky clothing. Local development groups are exploring new, less conventional models, such as pop-ups and farmer’s markets. A program called, Queen City Pop-Up, provides rent-free space to entrepreneurs and artisans in an effort to prove downtown retail is not a lost cause. As a result, five new businesses have opened and now have banded together to promote downtown as a destination for shopping. But still, some pop-ups found that they couldn’t justify the cost of having a storefront and decided to go full ecommerce. The City of Buffalo and its residents still have hope that downtown can thrive once again. But, for that to happen, everyone will need to think outside the box when it comes to filling its empty storefronts. Appealing to the needs of commuters would be a great place to start. Businesses who do decide to open downtown will need to provide enough value to entice, not only those who live there, but also those who work there, to leave their office and play there as well. And, if successful, maybe some of those commuters will become residents. Click here to read the entire story published by The Buffalo News, “For downtown, a renaissance without retail” by Caitlin Dewey.